Kitchen cabinetry is not just for storage. 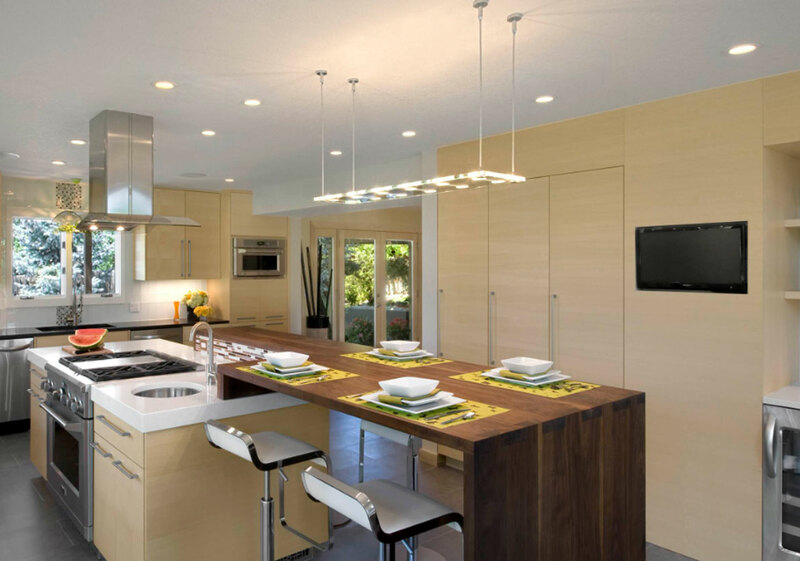 It is an essential element to your kitchen’s style when doing a kitchen remodel. Cabinetry is the crown jewel that brings everything together. Cabinet design has not changed much over the last few years; at least not as much as other elements such as countertops or flooring. But here are still a few evolutions that have happened to kitchen cabinets over time. Today, above anything else, there is a rising movement towards a streamlined look that focuses on simplicity and minimalism. Here and there however, you will find some wild and bold options popping up. 2018 will see both styles get their fair share of love from homeowners. 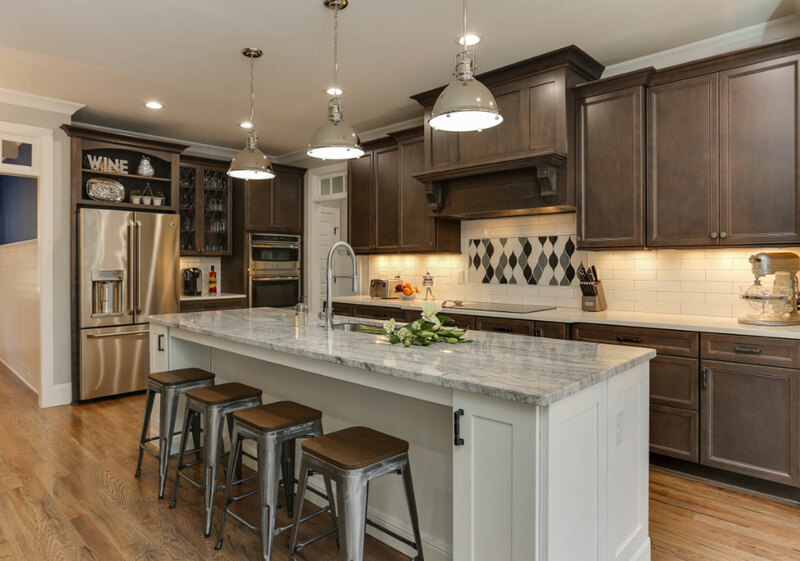 While simple clean cabinetry will keep getting popular, some homeowners will prefer unique customized styles that will make a clear statement. To design the perfect kitchen, it is important to understand what is imperative to you and then incorporate the latest trends around that. Here are the 9 hottest trends that will dominate kitchen cabinetry design in 2018. Open shelves look beautiful in the magazines, but not necessarily a “must-have” for most homeowners. Lets face it, you have to have a matching set of dinnerware or specialty pieces you want on display. But with good organization and the right kind of shelves, you can create a really unique cutting edge style for your kitchen. Open kitchen shelves instead of wall cabinetry is becoming an even hotter trend for 2018. While you may find it hard to go without your beloved closed door wall cabinetry, open shelving has plenty of benefits. It introduces a light and airy feel offering the illusion of more space which is especially great in smaller kitchens. It’s efficient, since you can see and grab what you need without taking the time to open cabinet doors to look inside. Considering everything is out in the open, be thoughtful about whatever you place on the shelves. Every utensil, bowl or glass has an impact on the overall aesthetic of your kitchens look and feel. Here is where you might find similar-colored utensils that create a more uniform look. You can also use wine bottles, mason jars, and fruit bowls as decorative elements. If you have a favorite coffee mug or special recipe books, use them to make the shelving more interesting. But as you mix and match all these elements, think about their individual colors and styles. Try to create a harmonious look that minimizes the risk of clutter that comes with open shelving. For small kitchens, be careful not to overload the wall shelving. Keep only the bare essentials and place the rest in your items in the base cabinets. Not only will it make it easier to keep everything well organized, it will help you maintain a sharp look. 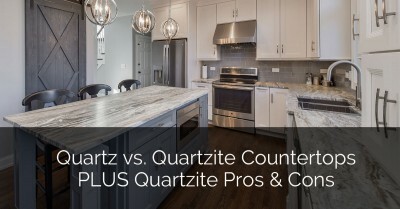 Homeowners are no longer satisfied with cookie-cutter kitchen designs. They want something unique that builds character and personality or provides a bold statement. Color is one of the most effective ways to take notice. A different color of paint on your cabinets can make all the difference and separate you from the pack. Manufacturing companies are taking notice too. Even though they provide the latest and greatest finish colors, they are still appealing to the masses. So, they have teamed up with paint companies to provide a limitless array of color for you to be inspired by. For cabinetry, homeowners are favoring customized colors that perfectly fit their kitchen spaces. Neutral colors are currently big favorites with tones like grey, yellow and soft greens but don’t count out the darker color pallet. Black, navy, and emerald green has the high-end allure many desire. There are three major color categories you can choose from: light, medium, and dark. Light tones are mostly the neutrals mentioned above. They are loved for their simple, soft clean look. They project a timeless style, perfectly complementing other elements in the kitchen. Medium toned hues are the most common. Here, standard shades of blue, grey and yellow are popular. On the extreme end of the scale, there are dark shades. Here, emerald green, inky black, navy blue and jeweled plumb tones are common in kitchen cabinetry. Dark shades are the boldest, creating drama and unsurpassed luxury. Still, they are less popular compared to medium and light shades. Basically, homeowners are seeking out unique colors that not only stand out but work specifically for their kitchen. If you are ordering custom made cabinets, you can choose any color you want. If you already have cabinets and want to renovate them, either get a professional painter or get ready for some extensive DIY painting work. Oak wood cabinetry is starting to creep back into the kitchen and bathroom marketplace with Cerused and driftwood finishes. In the 1970’s well into the early 90’s, they were the cabinet of choice. Usually seen in a honey spice stain, a version of a raised panel cathedral door with wild grain patterns became the mainstay in many homes at that time. 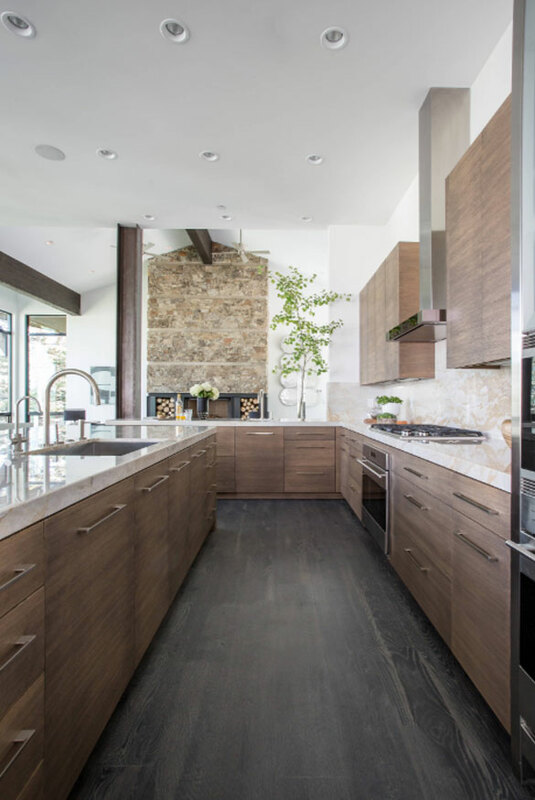 After a much-needed departure, the popularity of maple, cherry and a rise of engineered wood alternatives reduced the use of oak cabinet constructions. Materials like wood veneer and painted MDF are now more common in cabinet door construction than ever. 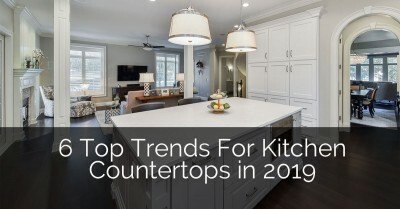 But as with other parts of the house, many homeowners are seeking connections to their past and a renewed attention to vintage, with kitchens being no different. The appeal? Neutral color, dimension & texture, and newfound soft luxury that can be layered into any space creating a blended balance. Oak cabinetry is versatile in its look from seaside or French cottage, clean modern simplicity or a common rustic look. Often creating a connection to the natural element. This is why oak, despite its stigma with the past, is becoming more popular option in cabinetry construction. Manufacturers are crafting a variety of interesting door styles–from recessed panels to flat slabs with an inset detail and finishes using oak. You can use oak in its natural color or opt to give it a coat of paint. Shades of black, blue, & grey seem to be a rising favorite for homeowners. Transitional styling is the “Goldilocks” zone of home décor. It’s the one true constant that can travel throughout all styles. Dabble in contemporary elements without straying too far from the warmth of traditional design. It can be the combination of natural stone-look tiles with gleaming white walls and 50’s style sofas or a match between wood wainscoting and modern leather and glass furniture. When it comes to kitchen cabinetry, transitional styling isn’t new, It’s become the mainstay. You will find a combination of differing degrees within this style from the subtle to the dramatic. Like taking Euro style wood cabinetry and placing it in a pre-war building with ornate architectural detailing on the walls & ceiling. 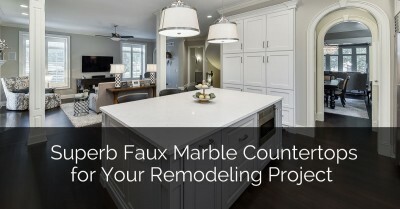 Or combing styles, traditional shaker style doors painted white, ornate chandelier above the island, with marble countertops, and flat black hardware. It’s easy and effortless. Transitional style is perfect when you want something comfortable yet a bit interesting. If the minimalism of contemporary style appeals to you, but you still cannot leave behind the nostalgia of traditional styling–transitional kitchen cabinets are perfect for you. Kitchen cabinetry has not been spared the modernization wave that has influenced home décor in recent years. One of the most obvious impacts has been the adoption of clean aesthetics in cabinetry constructions. This minimalism trend is likely to continue into 2019 and beyond. Modern cabinets are free of the ornate design work often found in traditional cabinet door styles. They feature a recessed panel door with smooth edge profiles and simple clean lines offering only the simplest of design elements. Even the handles themselves come in low profile styles, not demanding too much attention. Essentially, all the clutter has been pared down to the bare minimum. This type of cabinetry works perfectly with a modern styled kitchen, complementing other components like the countertop and the backsplash. Thanks to technology, homeowners today have an almost endless list of cabinet finish colors and techniques. From warm browns to weathered gray, the choices are mind-boggling. For more ideas, check out our Dark Kitchen Cabinets article. 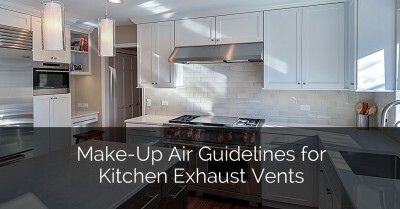 Homeowners are taking advantage of these unique choices. One of the upcoming trends in 2019 involves mixing different finish colors for a completely unique look. You might have the upper cabinets finished in painted white while the base cabinetry is a natural wood look. It is all about creating an interesting design by combining different bits and pieces. 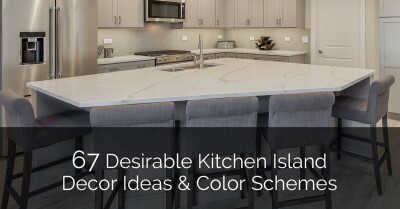 One easy way is by making the island a different finish color than the perimeter cabinets. Since the island is more like a piece of furniture, it’s an easy breakaway piece that you can feel comfortable being bold. We are seeing lots of black, navy, and chocolate brown at this station. But don’t just limit yourself to just those options. If you want to take it a step further, you could try mixing two stark colors like black and white or what about going green? As long as there is a wood element in the space you can’t go wrong. However, this may require neutral colors for the countertop, walls, and flooring. Like with most other areas of the house, homeowners are looking to create personal styles with bold statements rather than use boring cookie cutter designs. This trend is just an expression of the desire for more personality. Focused on functionality, today’s kitchens are being designed with large single bowl sinks or with multiple sinks. Since handwashing dishes isn’t a regular occurrence in households these days, the need for a double bowl sink is less important. In part, the farmhouse design has become extremely popular. Farmhouse sinks are popular mostly for their large deep sizes, that allows for more comfortable use, and style. If the apron front sink doesn’t fit into your design, then opt for a single bowl undermount sink in the same width as a double bowl. These sinks are perfect for larger items such as cookie sheets, stockpots, and skillet handles. For those of us that receive unexpected guests, you can quickly stow dirty dishes out of sight in these generous sink basins. In addition to the main sink, you might find an additional prep sink at the end of a run or in the kitchen island. This allows multiple people to work in the kitchen at the same time. We are also seeing a rise of unique and fun faucet designs. A faucet is no longer just a faucet. Though a relatively small component, a unique faucet can add a pop of style or color to your kitchen. Today, faucets come in all shapes, curves, and twists. 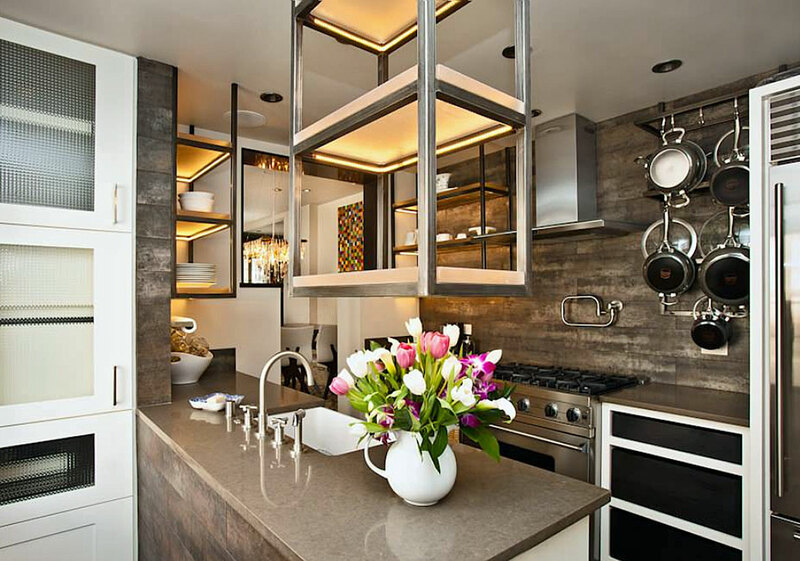 Pot filler faucets are mounted on the wall with a long arm that can extend over cooktop to fill large pots. Others come with unique spray mechanisms while others are embedded with sensors to get water flowing automatically. You can even expect to see designs that look like they came straight from your favorite restaurant. There are all kinds of sink and faucet designs to consider–futuristic, vintage, whimsical, luxury etc. It was inevitable that technology would find its way into the kitchen. In this day and age, we are inseparable from our gadgets. Thus, kitchen design has changed to meet our gadgetry needs. At the basic level, modern cabinetry should have a charging station for your range of mobile devices. If you use your smartphone or tablet to follow recipes or watch cooking videos when working; consider installing a docking station or device holder. For really high-tech cabinetry, you can have wireless devices built right into the cabinetry. This may include wireless music speakers, televisions, or a tablet. LED lighting has had a particularly good run as homeowners change over from traditional incandescent bulbs. It provides good lighting for activities, comes in a variety of colors and the bulbs last for a really long time. This has made it a popular option for under-cabinet lighting. 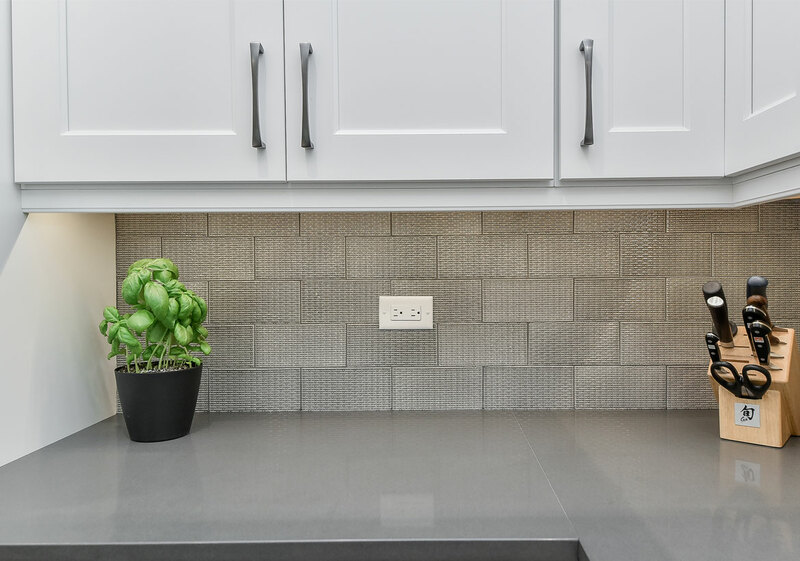 Under cabinet LED lights come in different forms including pucks, strips, and bars. When fixed under the wall cabinetry, they help add light to the working area as well as improve the overall ambiance. LED is not the only type of lighting that can be fixed under the cabinet. You could opt for fluorescent fixtures, which are almost as energy efficient as LED and produce minimal heat. Xenon lights give off some heat but they can be dimmed and have an attractive warm glow. You could also go with halogen lights, but this is not always a good idea. They give off too much heat which could affect foods or drinks you have stored inside the cabinet. In recent years, cabinetry has undergone more changes than at any other time. A rapid change in tastes combined with advanced technology has given rise to a wide variety of styles. For 2019, the general trend is towards personalization. When it comes to color, finishing, and overall design; homeowners want something unique and personal. 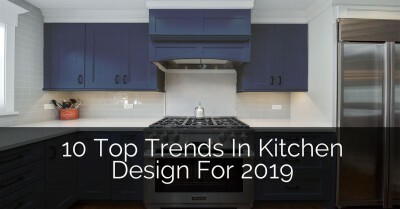 If you are building a new home or planning a kitchen renovation in 2019, which trends will you opt for? Gorgeous !! Dream kitchen. Well-placed under-cabinet lighting can bring illumination to your kitchen, creating character and making kitchen activities a breeze. Beautiful cabinet counter for the kitchen. Really unique and beautiful cabinets makes the kitchen shinny and modern. Love the Color Customization trend! In my kitchen the cabinets are white but I am thinking now to paint them. Have not yet chosen the color – maybe the same grey as in your article. Very informative article. Wood cabinetry are in demands these days. I had my my kitchen remodeled couple days ago and got my amazing solid wood kitchen cabinets. I love the idea to get lighting under the cabinets. I think that would be great to dimly light the kitchen when you want a quick midnight snack. I’m often up late watching movies and don’t want to turn on the bright kitchen light, so those would be perfect. Typically, cabinets take up a significant portion of your kitchen. If they’re old and outdated, they’re an instant eyesore and can impact the décor of the entire room. 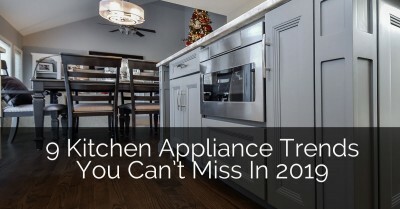 In some cases, they may not be the right kind of storage your family needs in the kitchen. Adding LED lights under cabinets is definitely a good idea. I’m thinking of giving my kitchen a new look by adding more color to cabinets. I’m thinking of adding solid wood kitchen cabinets in shaker white with subway tiles for backsplashes. A kitchen cabinet can be a great addition to any kitchen. Not only they increase the storage space in a kitchen but also add to its decor. Kitchen cabinets should be given importance while remodeling your house. Nice blog! and nice design of kitchen, this type of kitchen make homes attractive. Kitchen and cabinets design is the most desirable activities by any homeowner. The information you have shared is very informative. We are definitely seeing our clients using open shelving. Black and white cabinetry are in, with the uppers being a different color than the lower cabinetry. Thanks for sharing you insights. At the end of this summer, my husband and I are hoping to remodel our kitchen. Particularly, we want to make sure we choose the right custom cabinet design to make our space functional and beautiful. Like you said, a common recent trend is the adoption of clean aesthetics in the construction incorporating minimalism. We will have to consider this. My wife and I want to remodel our kitchen soon and are looking for ideas on what to do with it. I like that you mention how transitional styling is really popular and uses a mix of modern and classic looks. Combining something traditional with white cabinets but having a chandelier will definitely spark some interest for any guests who come over. Thanks for the tips! Cool article for some of the different trends that are coming about in cabinetry design. I thought it was interesting to learn about the transitional styling, especially since there can apparently be a combination of different styles with this. I wouldn’t mind visually seeing these differences, and how they fit in to the overall space. Updating my cabinets seems like a change that my kitchen needs. I have wooden cabinets that are looking pretty old and worn out. Installing a new set of cabinets that look freshly painted would really help to freshen up my kitchen. I really like the LED lighting beneath the cabinets that you mentioned. Not only are they energy efficient like you mentioned, they also have a longer life than most lights. Also, you can buy some that allow you to change the colors. This is timely and very helpful to me. I’m considering a kitchen remodel, and understanding how things are constructed helps in knowing what to stay away from. 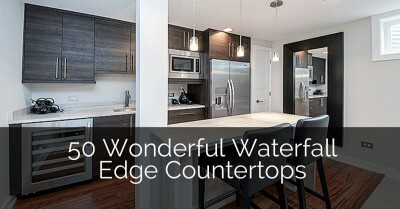 Thanks for sharing your article about kitchen cabinetry. The photos you showed are absolutely beautiful. I liked your tip about color customization because of the unique outcome that it can offer. In my opinion, when you choose the color of your kitchen cabinets; your personality speaks up. I’d make sure to hire a contractor who can help me have my kitchen cabinet style repainted with new colors. 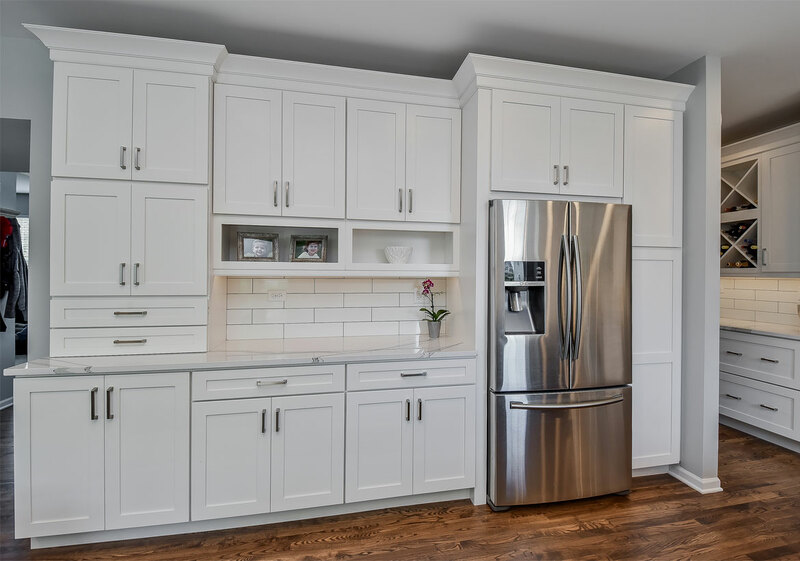 It was nice how you mentioned in a part of this article that among the trends of new cabinetry is the idea that unlike old times wherein the cabinets have heavily ornate designs, new ones are smoother with simpler designs. The house I live in has a lot of early 1900’s design items and valuables, and I want to add a touch of modernization to it. I think I’ll get a customized cabinet to match the rustic designs. Thanks! We’re not locked into any design formula and understand that every home presents unique opportunities and with it, the possibility of a single, tailored design solution. Love the article. Keep it up! My husband and I are redoing our kitchen because it’s just dark in there right now and old looking. I like how you say that open shelves will make it feel airy and bring more light into the room. We should probably find someone who can design some kitchen cabinets for us that will have that feeling. These kitchen cabinets are looking so gorgeous. I was searching kitchen cabinets ideas for my new kitchen. I got some great ideas from this article. Thanks and keep sharing. Informative article, just what I was looking for. I am reading this enormous paragraph to improve my knowledge. It’s because that it’s very useful for everyone who needs this kind of thing. Keep up the great work. 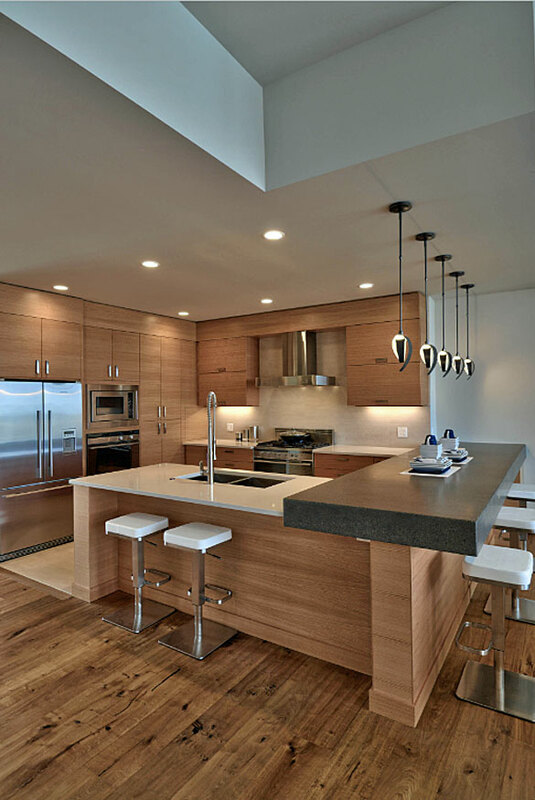 I found it interesting when you mentioned that modern kitchen cabinetry is gearing towards simplicity and minimalism. Between work and taking care of the kids, we barely have the time to take care of my mom who used to live with us. We have since moved her to a nursing where she will be better taken care of. Since then, the kitchen looked dull and lifeless. I wanted to reinvent the kitchen by changing the cabinets but I have a very specific concept in mind. I think I’ll be needing a contractor that can build custom cabinets based on my specifications. I really learned a lot from your article. Thanks for sharing it! Today’s cabinet design is very charming and simple but will catch your eye. Thank you for the great tips you shared! Thanks for sharing the latest trend of kitchen cabinet. I am also looking for a cabinet for my kitchen. I am really amazed to read these amazing tips.. Thank for sharing these knowledgeable tips. Can I have white doors on espresso cabinets? Need to lighten kitchen and doors need refinishing. You certainly can, however painting the doors and the boxes may be another consideration as well. I liked your blog, really helpful. Keep on the good work. 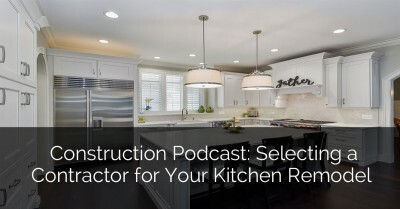 I consider this a good example and complete kitchen remodel guide. Kitchen cabinets are undeniably the heart of today’s home, so we only want the best. From it’s wood materials and up to finishing. Thank you for sharing all these ideas of different kitchen cabinets. I believe each type of these are great, I personally like the use of LED lighting under the kitchen cabinet. I think it helps with emphasizing the construction and it gives a subtle drama and contrast. I’ll make sure I will add this up in our next kitchen remodeling. Well-written article, thanks for sharing. Wow, I never knew that mixing two different finish colors in kitchen cabinets was a trend, but I think it looks great from the picture! It really would give you more creativity and options to work with, so that would be really nice. I’m trying to get some new cabinets, and I want whatever is ultra-trendy and modern right now so that the cabinets will match the rest of our remodel. I’ll have to find a company that has a lot of options to choose from and knows how to work with multiple finish colors so that we can get what we’re looking for. I believe in clean and streamline kitchens. That way you can have your customer really personalize it once you are done refinishing it for them. I love shabby chic with a twist of modern right now! Excellent ideas! I’m selecting white shaker-style cabinetry for our unit in a senior cooperative. We hope to live there for many years. Will I likely to regret choosing white? I’ve always had wood-stain cabinets, and I still think that they have a rich, warm feel. But without any windows in our new kitchen I am hopeful that white will brighten up the area. Hi Paula, thanks for reaching out. While several other cabinet colors are trending in home design right now, that doesn’t mean white still isn’t a timeless look. 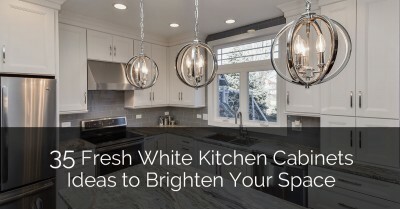 While every situation is different, it sounds like white cabinets would be perfect in your kitchen. Good luck! Hi, the blog is really helpful. The designs are all classy. Looking forward to your another blog. Thanks for sharing new ideas. Thank you so much for sharing this idea. This very helpful especially for someone like me. Transitional styling is what I like the most. Combination of stones with a touch of 50’s era. Thanks a lot! A nice blog you have shared with us all and it is very knowledgeable, aware about something which we don’t know. I am very thankful for your post so much.